Webster University offers its deepest condolences to the nation of Thailand and the royal family on the tragic loss of His Majesty King Bhumibol Adulyadej. He died Thursday in Bangkok at the age of 88 and was the longest-reigning monarch in history. Thailand, which has hosted Webster’s campus in Cha-Am since 1999 and its Bangkok location since 2003, has entered into a one-year period of mourning. Residents in the country have been asked to refrain from public jubilation for 30 days out of respect to those who are grieving. The Klaikangwon Palace, the King and Queen’s primary residence, is located in Hua Hin, located near the Cha-Am campus. Students, faculty and staff often passed the palace grounds while visiting local shops or traveling to the campus. During his 70-year reign, Thailand was transformed from a mostly agricultural economy to a modern one of industry and commerce and a growing middle class. As a result, he was a beloved figure in the nation, with pictures and paintings of him found in public places all over the country, from government buildings to highway overpasses. The loss of the King understandably is a difficult time for the people of Thailand because of the tremendous impact he had on the nation. 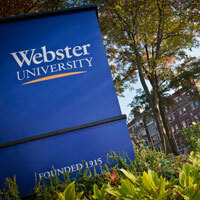 Webster University wishes the people of Thailand well during this period of grief.